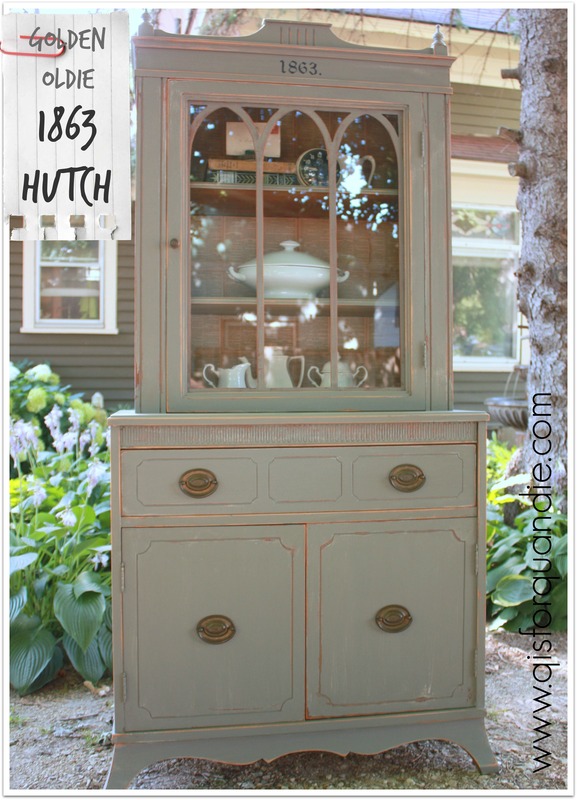 I painted this gorgeous hutch last summer. I wish I had a ‘before’ pic for you! I knew the moment I saw the craigslist ad that this would be gorgeous painted. It wasn’t horrible, but it was rather outdated looking in its original state with a rather orange-y stain. You can see that I lined the inside with pages from an old Swedish bible. I hand painted the ‘1863.’ at the top. It’s not a stencil, I just printed the image off my computer, traced it onto the cabinet using tracing paper, and then painted it in with a small brush. Yep, she was a beauty. I sent this one up to the Round Barn and it is long gone. Sniff, sniff. Previous travel the world desk. Next my barbie wore chanel. I can see how this would have sold quickly. She is a beauty. Beautiful!…I understand why you wish you had kept her. She’s a beauty – I am sure you are wondering why you let her go. Love the stencil look #’s very steady hand I’d say. Yeah I like the gothic arches too. 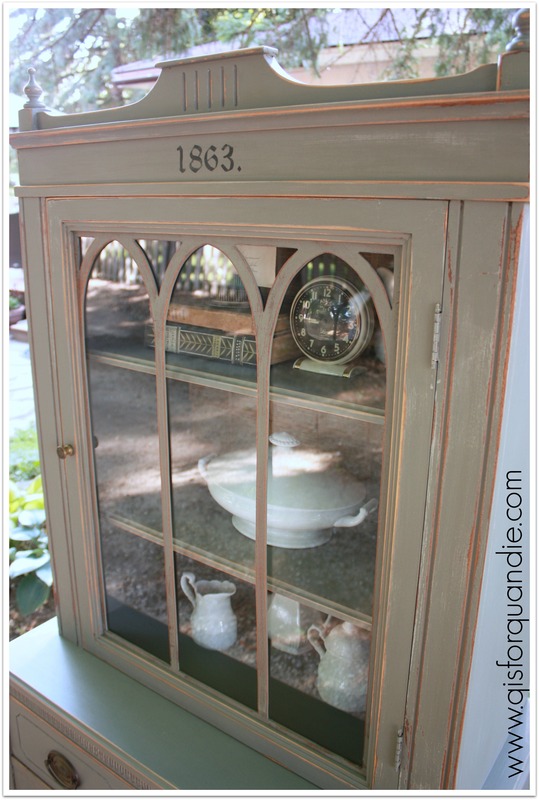 I would love to find an old secretary desk with bookcase on top. More places to merchandise. 🙂 I am thinking about working on my winter chair purchase again cause I have decided I am going to keep them. In my defense I have painted 3 Adirondack chairs this summer. Now wouldn’t that be nice – I am searching for some #’s for my upstairs doors today. 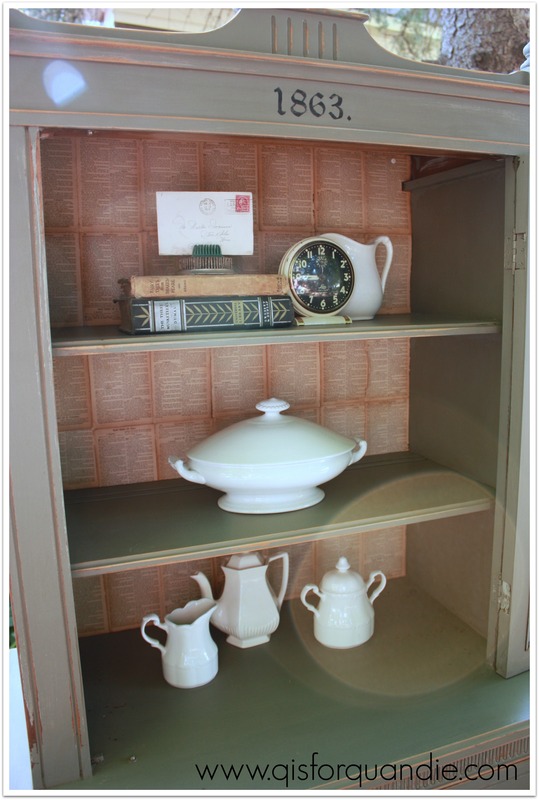 Still looking for an old french book to add pages to my cabinet. I have also been looking for soaps. I really want the cube shaped ones. Do you have a source? Amazon is the only place that has them $6.99 a pop – I may cave and buy them this weekend. Nope, don’t have a source for the soaps. Wish I did. I think the Amazon price is probably as cheap as you will find them though. I always feel like fabulous French soap is an easy thing to splurge on, since even as a splurge it’s less than $10. Email me if you can’t find numbers that you like and I’ll cut them on my Cricut for you. I have a limited supply of font cartridges, but I have some good ones. Gorgeous and I can see why it went fast! Love the pages as the back! Thanks Darrielle. I have used the pages from that particular book on so many projects! They are really gorgeous. You are so talented! This piece is so beautiful! I think this is one of my favorite of all you have done! So you used authentic bible pages?? I have been told by “my people” that that is awful to do!! Ha, I am so glad you did use them though. I don’t get why it would be “the wrong thing to do”. I wanted to make a paper wreath for christmas out of a tattered german bible and use some of the pages in resin pendants and ornaments. I have to admit that I gave in to “my people” and have not dared use them that way:( Its very beautiful to me on your piece. Lord give me strength to be creative with your word. Thanks Quandie. Well, it was in Swedish, which I can’t read anyway … so that doesn’t really count, right? And I bought it at a garage sale for 50 cents, it wasn’t a family heirloom or anything. I have to say, making a paper wreath for Christmas seems like a pretty fitting use for an old bible to me. How could that be wrong? And besides, you’re using it to create a thing of beauty, it’s not like you’re lining a birdcage with them! A priest who sells church statues dis-blesses things near here. I guess it is kind of like an annulment. (This is said tongue in cheek.) Love this piece. It is gorgeous. Thanks Robin! Looking back at some of these golden oldies, I am reminded of different treatments that I should go back and use some more.